Voice of America is reporting that the U.S. Citizenship and Immigration Services (USCIS) begun issuing new tamper-resistant green cards on May 1st, 2017, making it very difficult for prospective fraudsters to tamper with it. VOA said Monday that he redesigned cards, which have enhanced graphics and additional security features, are more secure than the old ones. “The new card designs demonstrate USCIS’ commitment to continue taking a proactive approach against the threat of document tampering and fraud,” VOA quoted USCIS as saying. * Display the individual’s photos on both sides. * Show a unique graphic image and color palette. * Have an image of the Statue of Liberty and a predominately green palette. * Have embedded holographic images. * No longer display the individual’s signature. * No longer have an optical stripe on the back. 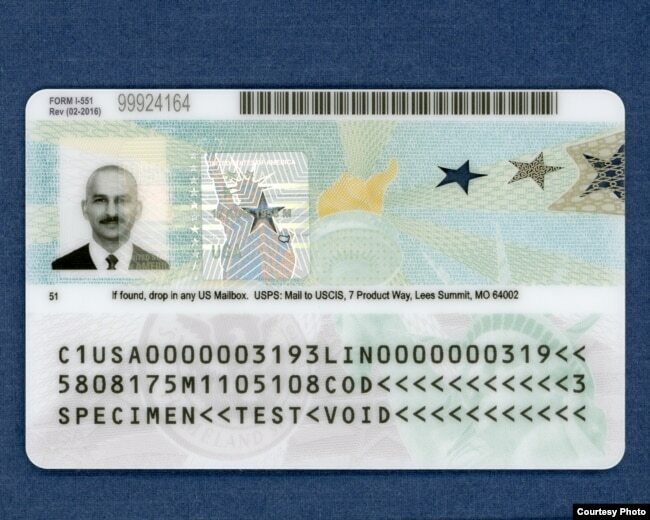 While May 1 is the launch date for the new cards, USCIS says some of the old ones may still be issued until they have run out. Both old and new cards remain valid until they reach their expiration dates. While the cards are new, the rules governing green card eligibility and the application process remain the same. HILARIOUS VIDEO: Kenyan Comedian Eric Omondi is Donald Trump!